My latest work is currently on view in R.E.M.X. at the National Museum of Contemporary Art, Bucharest until March 2016. The exhibition was curated by Calin Man and Ileana Selejan. The Digital Public Library of America chose this animated GIF as a winner in it’s GIF IT UP contest. The image is an amalgamation of Brooklyn, New York between 1898 and 2014. A 2004 work, “Shitao at 40 Different Moments in Time,” is on view at the in Lee Mingwei and His Relations, at the Mori Art Museum in Tokyo. New painting on view @ Tibi in New York. Most written accounts of the origins of video art trace the medium back to the SonyPortapak, the first affordable, battery-powered, portable video-recording device that could be operated by a single individual. The resulting democratization of video was quickly seen as having radical potential. Artists could challenge the rising influence of broadcast media. All of a sudden, the barriers to working in this time-based medium were removed. Read the entire piece on Hyperallergic. Read the entire article on Hyperallergic. Come visit me during Bushwick Open Studios. June 1st and 2nd: 12pm – 7pm. Details/artists directory here. Varone excels at making linkages in both form and subject matter between the installation’s disparate elements. He designs for the entire room, drawing the eye up and down with the serpentine forms and side-to-side with the scrolling projections. The most effective part of Varone’s approach is its subtlety. The work rewards slow, careful observation of its many connections and divergences. It Isn’t Always Going to Be This Great doesn’t seem so great to begin with—then blam! It hits with a punch line that is both well-crafted and frightening. Grizzly Grizzly is pleased to present “It Isn’t Always Going to Be This Great” featuring a new, site-specific installation by Jason Varone for May 2013. In this multi-media project for Grizzly Grizzly, the Brooklyn-based artist combines wall drawings of smoke plumes with a projected animation of animals falling from the sky. Simultaneously, a black & white video of explosions from aerial drone attacks is intermittently decorated with washes of color over a sublime, melodramatic soundtrack. Brooklyn, NY – Presenting new works by Jennifer Williams and Jason Varone, Another Landscape Show features work operating outside the canon of the traditional landscape. Working with imagery and media that investigate the underlying anatomy of a landscape, Williams and Varone emphasize the engagements, interactions and the culture of change that naturally take place in a landscape; revealing these to be more indicative of a place’s identity than its formal structure. GO is a borough-wide open studio project organized by the Brooklyn Museum. As part of GO, Brooklyn-based artists will open their studio doors to voters from 11:00am to 7:00pm on September 8 and 9, 2012. Community members registered as voters will visit studios and nominate artists for inclusion in a group exhibition to open at the Brooklyn Museum on Target First Saturday, December 1, 2012. Information about registering as a voter here, and my artist profile here. Brooklyn artists Jason Varone and Peter Daverington both had a presence, the former with a poetic text on a painted landscape and the latter with a haunting geometric pattern in space. Others that caught my eye included Wang Yefeng’s interactive projection “Well Disciplined Kids,” which plays with symbols of Chinese military power, and Anne Farrell’s “Cottage,” a projection of homes and watercolor paintings. While in Santa Fe for Currents 2012, I was interviewed on Santa Fe Radio Cafe. Audio of the interview can be found here. View photos from the opening reception of Process of Performance, curated by Stephen Truax, and produced by Janis Ferberg, at I.C.A.N., Sydney. August 12, 2011. Portal is extremely excited to announce the forthcoming exhibition of new video and drawing from six New York-based artists at I.C.A.N. in Camperdown, Sydney. Process of Performance takes on the documentation of artistic performances in video and drawing, and interprets them as metaphor for the process of being an artist, which can be much like a public performance. Ranging from the most seemingly banal experience, to time-based action, to performance, digital tools have become central to their works’ development and ultimate presentation. Kianga Ellis Projects (KEP) is a mobile gallery program that hosts conversations about the studio practice and work of invited contemporary artists. KEP’s inaugural Art Talks Weekend will take place on July 29th through 31st at HD3 on 560 Montezuma Avenue, located in the heart of the Sanbusco/Railyard District in Santa Fe, New Mexico. The weekend’s program is open to the public and will involve several of the artists attending in person and via Skype. Follow on the Web by watching the talks on Ustream and Twitter using the hashtag #KEP. War, economics, and the environment are all topics of news headlines; they are also the subjects of Varone’s art, sometimes with an emphasis on war or the environment but often recognizing that all three systems are interrelated. But headlines are the stuff of sound bites designed to draw us in, stimulate our anxiety, and provide little substantial information. They are the “Pop” in Lichtenstein’s appropriation of comic book and advertising iconography. As he reflects our social and political universe is there an incentive toward active resistance? By Varone’s own admission, his news is “bad news” – it can be overwhelming if it isn’t filtered. The irony provided by the childlike innocence of his line drawings mask the destruction designated by the crawlers – a tense standoff between the tolerable and the intolerable. These are six lines crossing at one point, at this time, at this place. The lines have different origins, different lengths, different vectors. Like the detective in Jorge Luis Borges ‘Death and the Compass’ (La Muerte y la Brújula) I look for meaning in these coincidences. I have applied the same level of intuition in my choices of artists as I do in the making of my own art work, believing that intuition (by any other name) consists of non deductive processes, and is the secret to the brain’s potential power. This animated GIF was uploaded to a handmade USB thumb drive. during their 2010 Holiday party/Artists gathering on December 14th, 2010. Locks Gallery is pleased to present alterations, a group exhibition featuring digital media, curated by the artist Peter Campus. alterations will be on view January 7th through February 5th, 2011. There will be a reception for the artists on Friday, January 7th, from 5:30 to 7:30pm. Artists: Peter Campus, Nayda Collazo-Llorens, Kathleen Graves, Beryl Korot and Jason Varone. In our fast-paced technology driven society, rarely is there time to pause for reflection or analysis of all the information we take on daily. Brooklyn artist Jason Varone’s piece Inclement Weather is part mural, part multi media video projection. 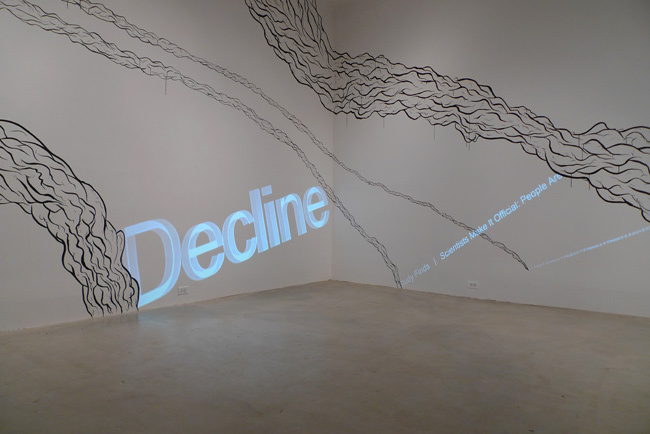 Composed of a cartoon cloud painted directly on the wall, a video projection of reconfigured, live twitter feeds and news feeds fall vertically like rain from the painting. Varone calls himself a landscape painter because he paints and creates topographically but he sees the new landscape as digital in our contemporary society. Much of Varone’s work explores how we perceive social issues through various media outlets. Just got back to New York after a three week residency at the Grand Central Art Center in Santa Ana, California. I was invited to work there by Jennifer Frias and Lilia Lamas, who curated MetaDataPhile: The Collapse of Visual Information, in which I have two new videopaintings. For those of you who were not in the Los Angeles region for the opening, here are some images of my work in the MetaDataPhile exhibition. The entire photo set can also be viewed below. Featured artists in MetaDataPhile are: Cory Arcangel and Frankie Martin, Josh Azzarella, Petronio Bendito, Matthew Bryant, Sky Burchard, Kathy Grayson, Rafael Lozano-Hemmer, Ken Rinaldo, Kim Rugg, Jason Salavon, Peter Sarkisian, John Sisley, Stephanie Syjuco, Michael Toillion and Jason Varone. Working at the GCAC was a great experience and I will be posting images of the work I made while in residence shortly. UPDATE: Some of the new pieces have been uploaded here.